October’s free 2018 #avgeek #wallpaper is live on the “Monthly Wallpaper” page. This time it’s the turn of the “Senior Service” and the Fly Navy Heritage Trust’s Sea Vixen (G-CVIX or Foxy Lady as she is known). 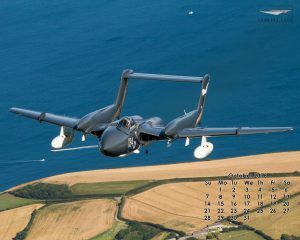 Seen here some time before her “wheels up” landing, this was after her display at Culdrose Airday by Cdr Simon Hargreaves when she joined up with the cameraship for some Air to Air images.